The students of Nagenda International Academy of Art and Design recently held an exhibition entitled ”Art the mirror of our politics” at the Makerere Art Gallery. What makes their work different and unique is that it has been produced and exhibited in the very same period when election exercises are still going on at the lower levels and people’s memories on these elections are still fresh in their mind. "Women Empowerment" by Katerega Saul. In this exhibition, each of the artists exhibiting clearly demonstrates his / her analysis of the events which have happened in Uganda during the last four months. The selection and analysis of the selected theme/s of the art works in this show, is personal and reveals the individual process of thinking, analysis and reflections. What appears in each of the works might not necessarily be a total sum of what the different artists have experienced over the last 4 months but a summery of their captured passing moments of Uganda’s campaign / election history. 25 paintings are on display in this exhibition. However, one common thing in all the art works on display is that the participating artists in this exhibition are not silent onlookers. 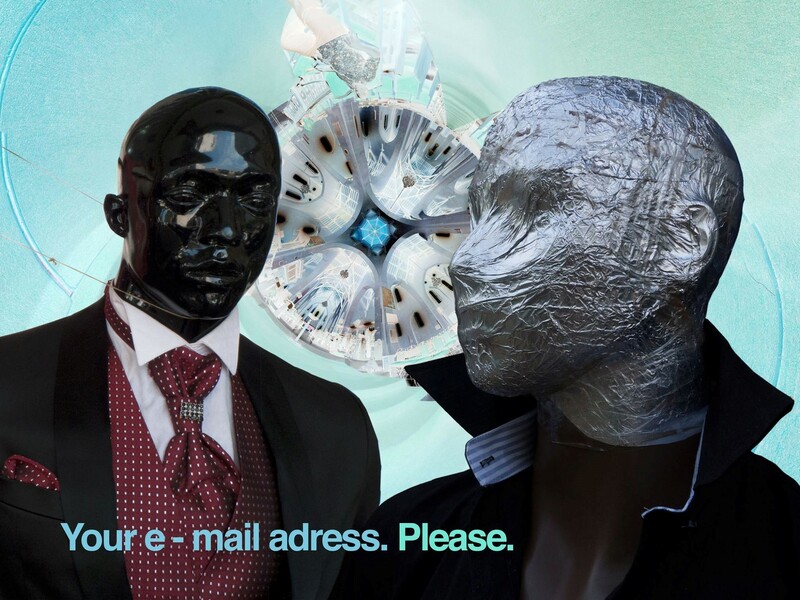 They are active participants who have based their visual thoughts on political, economic, and social issues which are in public domain, and have individually analyzed them, created images resulting from their emotional reactions to those issues. Since artists are drawing inspiration from the public, it is their responsibility and civic duty to produce art works for the public. 18th February Uganda Elections by Muhumuza Geofrey. 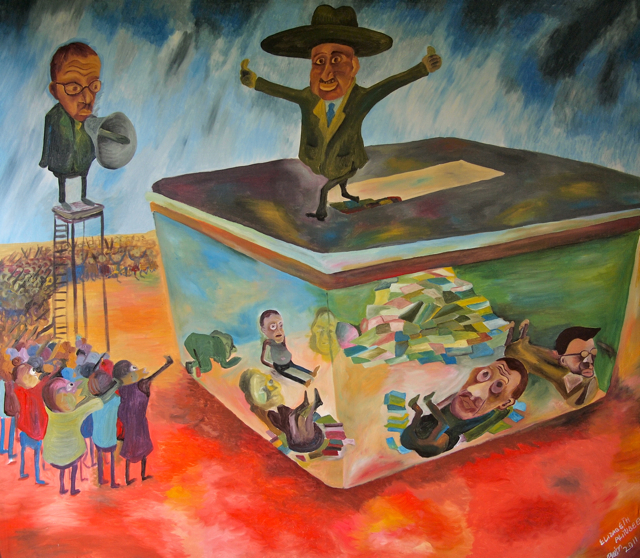 In the art work entitled “the 18th February 2011 election day in Uganda’’ artist Muhumuza examines the circumstances which surrounded the election exercise on the Election Day. People of different categories are presented scattered in groups trying to look for their names on the voters register, which are on the ground. The election presiding officers seem to be no where in this painting to guide the voters and the next step to be taken by the votes is not clear. Whether this election is taking place in a village compound or a bush, it is also not clear. What vividly comes out, is an atmosphere or election exercise which is not well organized logistically and administratively. Nakulabye, you are now are District by Ssemwogerere Isaac. In another painting, “Nakulabye, now you are a district” artist Ssemwogerere looks at the culture of creating new districts during the election time as process of bribing the voters to cast their votes for a particular group of candidates. His use of the village “Nakulabye” is symbolic. He metaphorically uses it to emphasize the point that any village in Uganda or sub county can easily be turned into a district even if it is not viable. To emphasize this point, Ssemwogerere presents a peasant almost a beggar who is receiving a small box from a contesting candidate who is well fed and dressed. The box being given to the peasant beggar” is the district, a bribe. Behind the big and well fed politician, stands a security guard dressed in a uniform, who attentively is guarding the politician – candidate. Surprisingly, the peasant who is seated on the stool in front of his hut is not guarded. So the question which arises here is: where is the danger which calls for guarding of the politician in the village? Ssemwogerere is silent about this and leaves the viewer to imagine and find the answers. Vote rigging has been a common practice of our political history in Uganda. Indeed, it is because of vote rigging that NRA/NRM went to the bush after the 1980 contested election which bought Obote II into power again. It was a fight against this injustice committed by the electoral commission of that time which endured many people to NRA struggle. It was hoped by many Ugandans that vote rigging would stop after Obote II was over thrown. Unfortunately it is a practice which has continued to survive and led some politicians to petition in courts, challenging some election victories as evidenced by Kizza Besigye 2006 Supreme Court partition, and the current Kasibante and Katongole’s on going cases in the high court of Uganda in Kampala. It is from this background that artist Alitubeera has produced a painting “The Aftermath of vote rigging in Uganda”. This painting vibrant in colour, is very tense in terms of physical force being used by voters who have decided to take the law in their hands to fight for their democratic rights. What we see in this work, is a rare occurrence where women use dangerous weapons to address injustices. In the right hand side of this work, a lady holding an axe in space, ready to strike on the heads of the crowd is running towards a men dominated crowd which seems to be at the centre of vote rigging. The Ballot box is left unattended to on the table, an indication that the problem is not the ballot votes or the ballot box, rather the people themselves who participate in the vote rigging. Also important to note in this work is the way the people who have fallen on the ground, are smartly dressed in suits, with big stomachs a clear indication, that it is those with money who are the architects of vote rigging. What is demonstrated in this painting is a function which is turned upside down because of politicians’ selfish interests. At the extreme left hand corner of this painting one sees peasant in canoe bearing the national flag. On the extreme right hand side of the painting, also stands a peasant riding his bicycle with again Uganda’s national flag. These two categories of people represent the sense of hope for those Ugandans who want sanity to be restored in our electoral system. “Brutality of the Police” by Kiffe Yoweri. The practice of brutality and violence in Uganda’s political – election cycles, is not only limited to civilians. It is a practice which is spread even to our security agencies particularly the police. Ordinarily, the police is supposed to be the custodians of law and order. This is the cardinal job of the police force in civilized societies. However, what appears in the painting titled: “The Brutality of our police’’ defeats this belief. What is presented in this painting, by artist Kife is scene of brutality, excessive use of force, against un armed civilians. Three men in police uniforms with anti riot equipments, bought using the tax payers money are standing like a lion read to attack its prey. The blue and red colours which dominate their uniforms, the masculine nature of their forms which make them appear as if they are beasts from another planet, all create a sense of psychological fear and terror. The presentation of an empty matatu taxi in the right hand corner on the painting in the foreground, empty with no people in it, shows the extent of brutality of our police force. Instead of people running away using a matatu taxi which can run first, they have abandoned as it is also being targeted by the police. 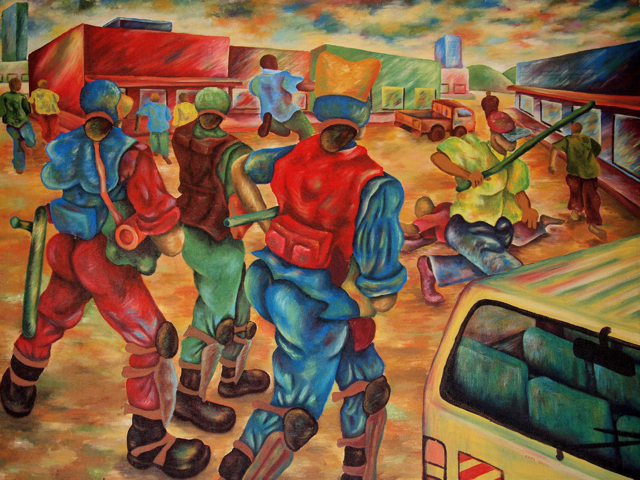 The empty matatu here is a symbol of the divorced relationship between civilians and the police.In the same painting, a member of the kiboko squad is presented who seems to be doing his work in the presence of the police. Indeed it is this painting ‘’the brutality of our police’’ which summarizes what has been going on during the recently concluded campaigns and elections in Uganda. "Running for Votes" by Alitubeera Elizabeth. “Running for Votes,” by Artist Alitubeera is another painting in which we see her ability to analyze the needs of voters and how the politicians are pretending to be concerned to address them. In this work Alitubeera presents the seven presidential candidates playing a football match. The use of the football match is symbolic. 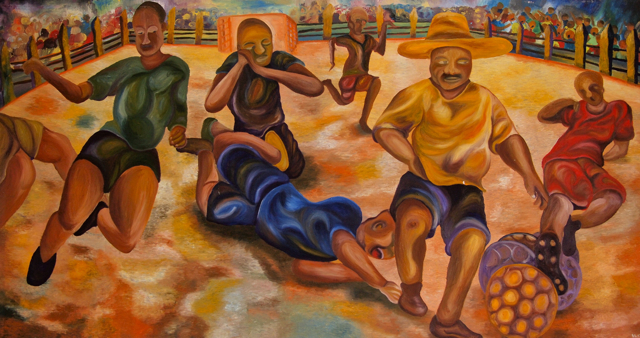 While a football match under normal circumstances is a sign of unity and mutual competition, In this painting it is used as a symbol of the absence of a common political, economic and social ideology for Uganda. Each of the presidential candidates stands for different ideologies to be experimented on while in office. This is emphasized in the way the players in the football field are stationed. The group spirit among the players is lacking what we see is an abnormal player, playing with a heart on his head. Is this an attempt to suggest that our presidential candidates were not serious in terms of addressing the needs of the electorate or is it an indicator of the absence of a leveled ground for the different presidential candidates? The answer to these questions is left to the viewer to imagine. However, while the viewer is busy contemplating on how to find answers to the raised above question, he/she is again shocked at the way the artist has confined the candidates in an almost cage frame. The interaction between the players in the football field and the public is very different. The artist here seems to be pointing out the detachment between politicians and the public. "Silent Sir" by Alitubeera Elizabeth After Mr. Ras. Alitubeera consistent metaphoric analysis and presentation of political issues in the painting running for votes, is again very visible in her other painting titled “Silent sir’’. In “Silent sir”, inspired by Ras’s cartoon work, Alitubeera presents another theoretical scene of the winner and the defeated. The winner with a big over sized hat stands on the top of a transparent ballot box, rejoicing stretching the hands like a crucified Jesus. The transparent ballot box not only contains ballots, but also catoon like figure portraits of some of the defeated candidates, who are in the dire need of assistance in order to manage to stand up again. The defeated presidential candidates are confined in a covered ballot box, with the winner standing on top, preventing those inside not to get out. The concept of putting the defeated candidates in the ballot box tends to suggest the on going debate concerning “who ever wins takes it all”. It also suggests the future where by the voice of reason, contrally views or oppositions will not be tolerated, by the winning candidate. Besides the winning candidate who stands atop the ballot box, stands a man on top of a platform which has stairs from bottom to top. This man in spectacles is small in size compared to the winning candidate. In order to be heard, he has to use an amplifier. This scene in this painting represents the electoral commission which stands at a different platform and which is expected to please all the candidates, a very difficult job. It also symbolizes the lack of independence between the electoral commission and the executive or the ruling party. "The 16th March 2010 Kasubi Masacres" by Nakanwagi Suzan. As one looks at the work inspired by the recent presidential elections in this exhibition , the attention is also directed to two painting one by Nakanwagi Suzan and another by Mukwaya Jessy. 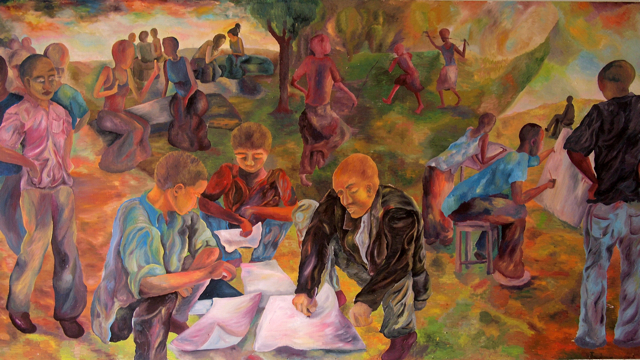 Nakanwagi’s painting “the massacre at Kasubi Tombs’’ is a direct examination of the events which followed the torching down of Kasubi royal tombs last year on 17th March 2010.On this day a number of people were gunned down and others wounded in the presence of government security forces. Innocent people lost their lives, but most importantly, the Baganda in Uganda lost their cherished tombs in which most famous kings of Buganda of our time, Muteesa I, Mwanga II and Muteesa II are buried. The tombs had become a symbol of Buganda ‘s finest achievement in terms of architectural design and civilization. They represented Buganda’s dynamic culture and exposure to the outside world. By shooting innocent people inside the compound of the tombs, whoever did it committed a taboo. In Ganda culture, it is unforgivable to kill innocent people in tombs where kings are buried. Dead kings are sacred. This event as portrayed in Nakanwagi ‘s Painting is a clear reminder of the 1966 Mengo massacres which were carried out by Uganda’s army of that time under the orders of Obote’s government. Therefore, In this painting, Nakanwagi is not seeing these massacres as isolated cases but rather as a continuation of the practice started in 1966 to destroy human life. The analysis of this work in its full totality, indicate a situation were human life is no longer having value, where people are like insects to be killed by spreading insecticides. This work is very strong in terms of narrativeness and Message conveying. "The 16th and 17th March 2010 Descecration of the Kasubi Tombs" by Mukwaya Jessy. Mukwaya’s painting; “the desecration of Kasubi tombs” looks at the act of torching down the tombs as a disgrace, uncalled for and as an international act of destruction. His use of suggestiveness forms amidst a sense of anarchy and commotion and lamentations, creates and sends a strong signal to the viewer to look beyond the act of burning down the Kasubi Tombs and consider the future of African cultures. By presenting people in the “Ganda Kanzu” attire, a symbol of yesterday, today and tomorrow, Mukwaya is trying to emphasize the enduring spirit of the Baganda to restore at one time their destroyed culture. By presenting a multitude of people in the painting, the artist is reminding those responsible for torching down the tombs, that the act instead of creating disunity among Baganda, will instead unite them. The tombs are destroyed, but out of desecration a new form of sacredness will emerge. That’s why he paints the sky with a blue colour, a symbol of hope, rebirth and peace. 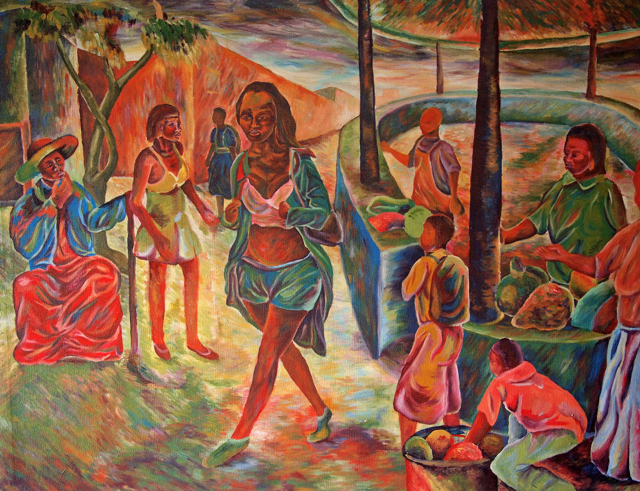 "Bonna Bagagawale" by Muhumuza Geofrey. 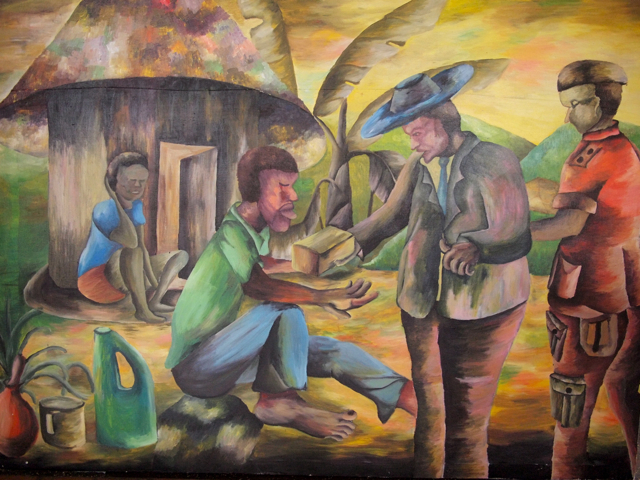 While many artists have looked at the negative aspects of Uganda’s recent past in terms of presidential, parliamentary campaigns and elections, Amos Kaleebu, presents to us another painting titled ‘’Bona bagagawale. He looks at how during the last five years the government has put a lot of emphasis on the Naads programme as a way of increasing family income. He presents a well managed farm and by viewing the crops and animals in the farm one gets a feeling of agricultural advancement. However, what Kaleebu does not analyze in this work is the status quo before the introduction of the NAAds programme and its future. It is this absence which limits our understanding of the philosophy of the NAAds programme. He does not see any relationship between politics and NAAds. The works in this exhibition about the political affairs of our country are not the first of their kind in our country. Various artists in the recent and long past have used art to politically critic their societies in which they have lived at different times. Dr Kizito Marie Kasule is a senior lecturer and currently the Head of the Fine Arts Department at the School of Fine and Industrial Arts, Makerere University. In 2008 he opened the Nagenda International Academy of Art and Design a self-sustaining school for teenagers and young adults. This show is trully refreshing. Not only have the artists utilized sublime colour schemes in their paintings but have also used the pictorial narative approach; something that had gone missing from ugandan paintings since the early 80s! i must thank whoever is behind this revival at the Nagenda int. academy. With this new breed of artists, we shall trully catch up and overtake the kenyan ‘self-taughts’ in the area of content!